Sometimes you’re going to find yourself without a bass player, or you might be going solo. Maybe you’ve come across a folk song you like, or maybe you’re trying out Ragtime. 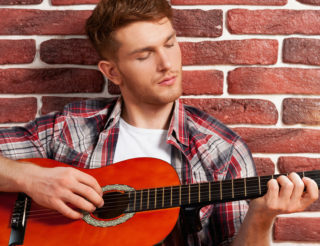 In any case, you’ll probably eventually encounter a technique called travis picking. 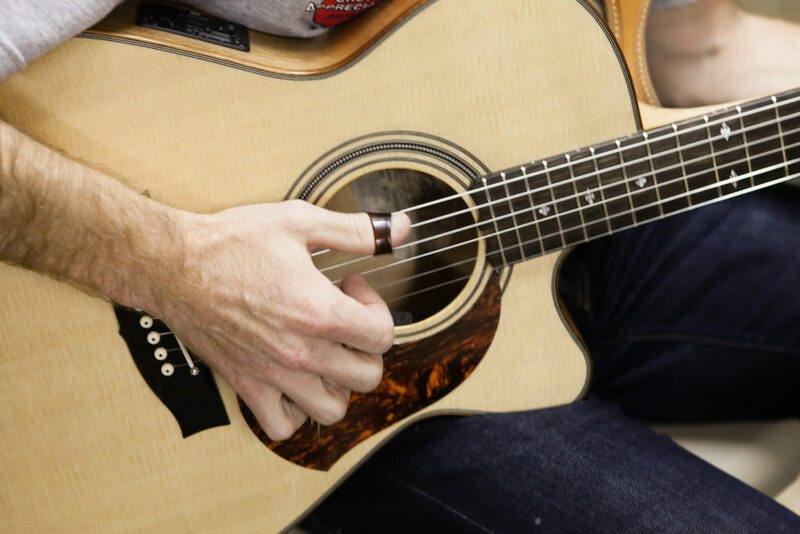 Named after the great Merle Travis, travis picking is all about using your right- hand thumb to play a steady bass pattern while your other fingers play the melody (often syncopated). It’s a fun way to become your own accompanist, but can be a hard technique to develop due to the difficulty that comes with controlling two different picking rhythms simultaneously. To make things a bit easier, this article will look at the fundamental aspects of the travis picking technique. Once you develop the basics, the rest will come together in no time! Got it? Great. 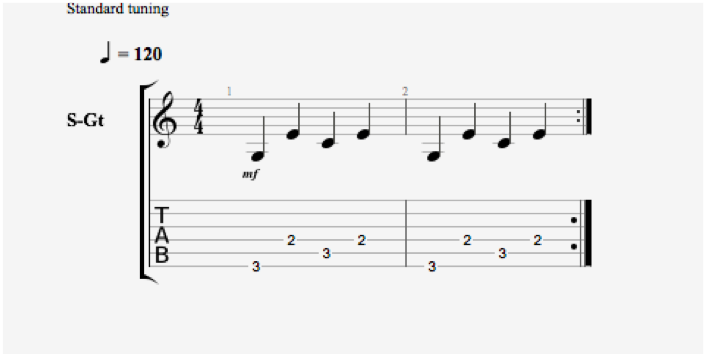 Now things start to get a little bit more difficult but I’ve simplified a short melody below to gradually introduce you to the idea of playing a melody over the top of this bass pattern. For the next few exercises, you’ll notice that above the thumb pattern, there is an added melody. As you advance your travis picking technique, some songs will require you to use a specific finger for ease of play. For now, however, I’m just going to focus on making sure you’re able to keep your thumb playing at a consistent pace underneath a melody- as this is the essence of travis picking. So, feel free to play these extra little melodies with either your index, middle or ring finger- whichever feels more comfortable. NB: Play this exercise on loop at 60BPM until you feel comfortable, then increase your metronome speed to 70BPM and try to get control of both the bass (thumb line) and melody (finger line). Do this repeatedly, increasing your metronome in gradual increments of 10 BPM until you reach 120BPM. Once you can comfortably control both your thumb and the melody at 120BPM, you’ll be ready for the next exercise. NB: Use the same practise method as before- starting at 60BPM and working up to 120BPM before moving to the next exercise. The third exercise requires you to move your left hand a bit more to create a more coherent melody line. I’ve still kept it very simple but as you can see below, you are now required to play a G note (third fret, high E string) on the first beat of the second bar and a D note (third fret, B string) on the first beat of the fourth bar. As before, practise this with your metronome at 60BPM and work up until you can comfortably play at 120BPM. Like a challenge? Once you hit 120BPM, keep increasing the metronome in gradual increments of 10 until you reach your breaking point. 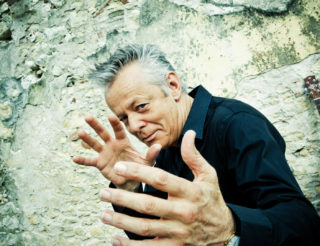 Keep in mind though that the travis picking technique is typically used in folk or ragtime pieces and you would most likely be playing at speeds from 100- 150 BPM. That was a very simplified breakdown of the travis picking technique designed for beginner guitarists to start to develop control and independence of their picking thumb. I’ll now look at a couple of song excerpts that use travis picking so that you can begin to expand on your technique. You’ll notice that this transcription is slightly more complex than the earlier exercises. The key to reading a piece like this is to pick out the bass line first. As I stated before, the bass note is typically played on every beat. 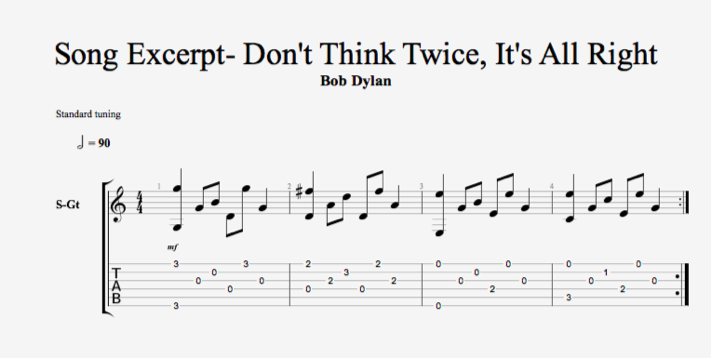 If there are two notes on that beat and you aren’t sure which one to play with your thumb- pick the lower note. Once you’ve distinguished the bass line from the melody, add the melody in and get to work with your metronome to build up the tempo! NB: Double speed- As per the tempo marking on the transcription, one half note is equal to 90BPM. This means that you should actually be playing two bass notes for every click of the metronome. Since that is significantly harder to achieve, I’d recommend starting slower at 40-50 BPM and working up to 90BPM. 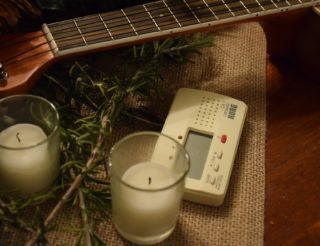 Alternatively, you can still play one bass note for every click of the metronome by starting at 70-80BPM and simply working up to 180BPM. 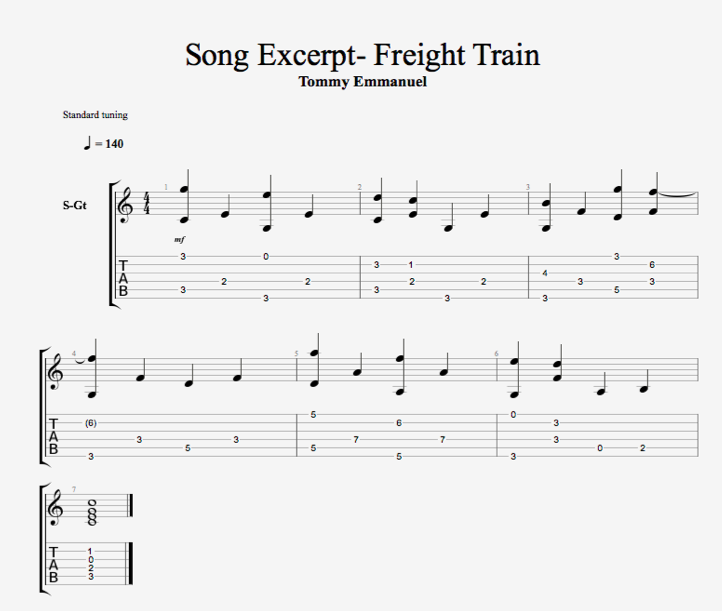 For those seeking a bit of a challenge, I’ve also transcribed the first few bars of Tommy Emmanuel’s Freight Train. This is a simplified version (without a lot of the syncopated melody). Again, if you’re struggling to read the transcription as a whole, try picking out the bass line first and practicing that. For this song, start at 80-90BPM and work up to 140BPM.